Market is at all-time highs. What should you do? Home > Personal Finance > Market is at all-time highs. What should you do? The Sensex recently breached 30K and Nifty breached 9K. With the two market benchmarks at all-time highs, investors are particularly worried that markets may suffer from bad case of vertigo and may come crashing down. So is this the right time to invest or is it better to sell and book profits? We looked at the previous instance of all-time highs to find out. So what does history tell us? If we look at the SENSEX history from 1997 (and Nifty will mirror it pretty closely), we find that there were 5 episodes in the past when the SENSEX achieved all-time highs (i.e. a value higher than what had been previously achieved) after a considerable period of time. All-time highs which were achieved within a short time of one another were considered as the same episode. Of these we find that three times – in July 1999, December 2004 and October 2013 – the high was a harbinger of a multi-year bull market (The first one driven by global bull-market associated with dotcom bubble, the second one was again driven by the global bull market of 2004-7 and the third one can be attributed to the Modi Wave). Investors who exited the market at those points or stayed out because the market was too high would have considered themselves very unlucky indeed. They would have missed out on returns of 19%, 216%, and 38% respectively (corresponding to CAGRs of 21%, 29%, and 18% respectively) till the eventual turnaround happened. However, we also find there are two other times – in Jan 2004 and Oct 2010 – when after attaining an all-time high, the market went down immediately afterward. However, if you consider the fact that you are always asked to invest in equities with at least a 5-year horizon, then these points were bad but not terrible times to enter. Over the next 5 years markets gave you returns of 11% and 6% respectively. To me, the biggest lesson from this study of historical episodes is that most investor’s worst case scenario that the market would hit a record high one day and then fall off the cliff the next day from which they would find very hard to recover has never actually materialized. In fact, the worst thing that would have happened to an investor who invested at a market high or did not get out is that they would have experienced below average (but still positive) returns over the next few years. Not that bad an outcome considering you are always advised to invest in equities if you have a 5 year+ horizon. So on the balance of probability, market hitting an all-time high is a good time to stay invested or even to enter. At worst you can probably expect flat to slightly returns for some time and if things turn out well we could be on the cusp of another bull market. One good strategy would be to invest through SIPs or via an STP from a liquid fund. This way even if this all-time high is just a fluke you would have invested less at an unfavorable entry point. But, what about market timing? Markets massively up one day and then down has not happened in the past. This is not a coincidence. If you think about it even though markets can be irrational sometimes, most of the times they are driven by fundamentals – what is happening to growth and inflation, what is the central bank doing. And fundamentals don’t move randomly. You do not get an 8% growth number one month and 4% the next. And hence you do not get markets making all-time highs one month and then a massive loss the next. While we have answered (or at least attempted to answer) the immediate question, the larger question lurking here is of market timing i.e. how to know when is a good time to enter and exit markets. Market timing can and does work. Like we mentioned earlier, markets are inextricably tied to fundamentals and fundamentals are not completely random. So markets should also inherit some predictability. However, before you decide to jump into full-fledged market timing it would be good to keep some things in mind. 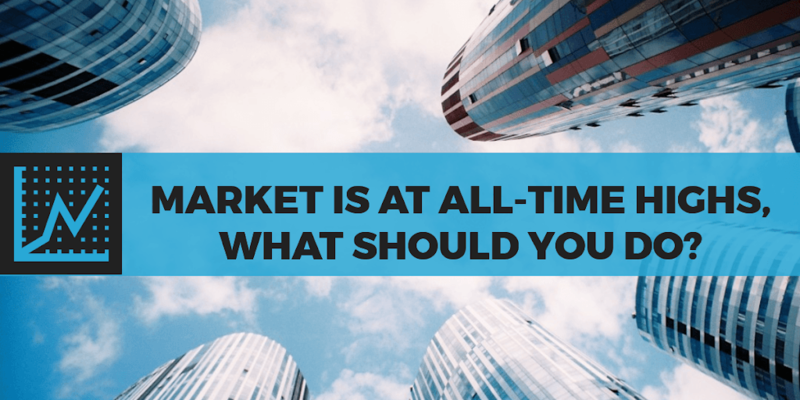 1: You are probably doing some market timing already: Many people invest in markets through mutual funds in which case they already have a manager trying to do the market timing for them. Of course, given their mandate, mutual fund managers can never actually exit the market but they can choose to invest more in cash or shift to safer equities. Another source of market timing is the SIP mode of investing which is quite popular and which we suggested as a strategy earlier. By using SIPs, investors can buy less when the markets are at a high (and likely to be over-priced). They buy more when markets are at a low (and more likely to be cheap). Those with a lump sum amount to invest can consider STPs from a liquid fund to equity funds to get a similar effect. 2: (Portfolio) Size matters: For small portfolio sizes, relying on your fund manager/SIP may be the best form of market timing. To implement more active strategies needs a large portfolio. This is because most good/successful market timing strategies will not be binary in nature i.e. either you are in or out. Instead usually such strategies only move in small steps based on the balance of probability. However, with small portfolios you can run into problems of minimum transaction size etc. which makes implementing active strategies unprofitable. 3: Market timing should not be ad hoc but systematic: Finally even those who have large portfolios should only pursue market timing if they can be systematic about it. For instance you may pick the right time to get out of the market but then you also need a strategy for when to back in. More generally, successful market-timers are not people who get every decision right (it is nearly impossible to have perfect foresight into markets) but those who get more decisions right than wrong. So timing the market is not a one-time exercise but something which has to be done repeatedly. Given the full-time nature of this job it may be better to seek services of a professional. Given history, markets hitting an all-time high do not seem to be a good time to stay away from investing/exit. Cautious investors with reasonably sized portfolios can opt for SIPs or STPs to reduce the entry point risk. Investors with larger sized portfolios can opt for the more aggressive market timing to know when the markets are getting “too high” but this should be done systematically probably with the help of a professional. This article was first published on IIFL website on June 06, 2017.